Over the years many icons within the world of Star Trek and science fiction have been offered a place within SFC as honorary members of our collective, taking pride of place within our ranks. An award winning visual effects artist, designer, sculptor, illustrator and make up artist, Doug Drexler has worked alongside many of Hollywoods greats including Al Pacino, Dustin Hoffman, James Caan and Meryl Streep. In the world of Star Trek he lent his visual talents to helping build the look and style of Starfleet including being the lead designer on the intricately detailed Enterprise NX-01. 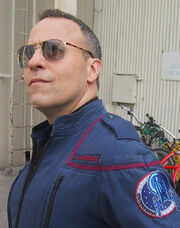 Accepting an honourary role in 2015, Doug Drexler stands in the honorary position as Fleet Captain, overseeing our Clydeside Dockyards. This section is currently in development and will be fully updated soon.